As law enforcement agencies seek to crack down on drivers under the influence of alcohol, fines and penalties associated with these crimes continue to increase. License suspensions and jail sentences are also potential repercussions, but the most common way drivers convicted of a DWI in New York are impacted are through expensive drunk driving fines that can reach into the thousands if the accused is a repeat offender. DWI – Offenders will face fines of $500 for their first offense, which will be considered a misdemeanor, but repeat offenders can find themselves fined up to $10,000. Repeat offenders may also be charged as Class E and D felonies. AGG-DWI – The repeat offenders here will again be slapped with the felony charges and face fines as high as $10,000, similar to the DWI charge. First offenders can still escape with a misdemeanor charge, but the minimum fine they face is $1,000. It is important to note that these drunk driving fines are indication of the conviction fine only. This does not include any mandatory conviction surcharges, crime victims assistance fee, civil penalty or fines associated with additional charges. Even the most expensive of these charges can end up much higher once all additional penalties, court fees and any attorneys’ fees are factored in. Additionally, all of these charges put convicted offenders at risk for lengthy license suspensions or even charges associated with installing and maintaining an ignition interlock device on their vehicle. While the only surefire approach to escaping drunk driving fines is to avoid getting behind the wheel after drinking, but hiring an experienced New York DWI attorney can help you protect yourself if you have already been charged. 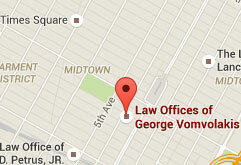 To discuss your case, contact the offices of George Vomvolakis via e-mail at gvomvolakis@vomlaw.com, by phone at (212) 682-0700 or at his office at 275 Madison Avenue, 35th Floor, New York, NY 10016.